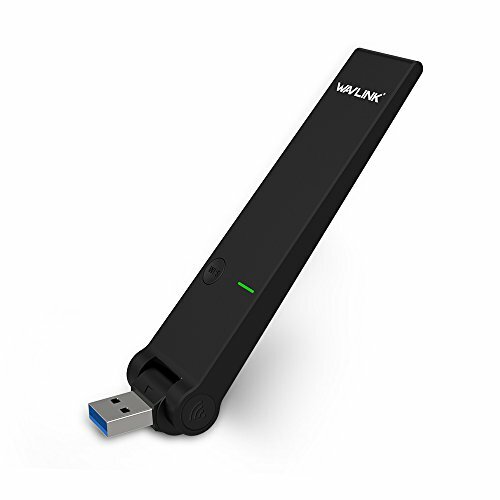 The dual band wireless USB adapter can be used to connect your desktop, laptop to a wireless network and access to an internet connection at high speed which is 3 times faster than Wireless-N speeds. USB3.0-the latest USB standard, ideal for 802.11ac network experience with blazing speed data transfers of up to 4.8Gbps, which is up to 10×faster than USB2.0. USB3.0 breaks the limitation of low-speed USB2.0 for 802.11ac high-speed experience. With a flexible USB port, you can plug it as you wish without worrying about congestion with other interfaces. After pressing WPS button 6s in the Adapter and 1s in the Router(different routers may have different times), you'll connect the network witout passwords. The one-touch WiFi Protected Setup(WPS) button allows users to easily secure a wireless home network. Whenever only one wired Internet connection is available, you can activate the SoftAP function of the usb adapter after installing the bundled utility software.As a result, you'll create a WiFi hotspot for mobile devices, which is useful for places where only one cable for Internet is available, and many people have to use the Internet. 1.For your proper operation, do not connect the AC1300 Adapter to your computer before installing the software. If so, wait for the Found New Hardware screen to be displayed, and then click "Cancel". Otherwise, the installation process may be adversely affected. 2.For Window 10 users, you may not be able to switch into the SoftAP mode. 3.If your computer's operating system doesn't install the driver automatically after plugging in, you just need to install the driver from the bundled CD or from Wavlink's website.